1) Inflation is nothing to worry about. Kinsley has been wringing his hands about this since 2010 at least, but as you can see in the chart above, it has been moderate before and since and is in fact probably too low. Inflation is no worry because there is still a lot of slack in the economy, mostly in the form of unemployed workers. The price level is set by market forces, not by magic, and increased economic activity will come largely in the form of new jobs and services, not increased prices. Like suppose Ben Bernanke prints up a few billion dollars and sends every citizen a big wad of cash. If this were an economy at full capacity, that extra spending would come in the form of increased prices as people bid against each other for goods and services. But in a depressed economy, there is lots of idle capacity lying around. If you want a bartender, there’s one for the hiring, you don’t have to bid one away from someone else. If people buy more shoes, companies can just run the shoe factory a bit faster, by adding an extra shift. Etc. And furthermore, the 1970s inflation happened at a time when many union-negotiated contracts had a price-of-living clause in them, thus transmitting higher prices into higher wages in a vicious cycle. Today, union density is back to pre-New Deal levels. 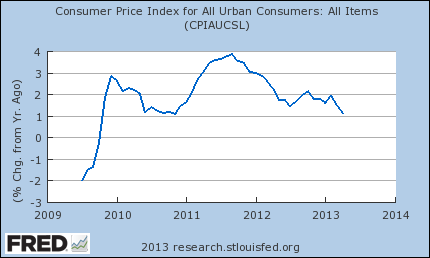 If Kinsley wants Krugman et al to take his inflation concerns seriously, he needs a story for how it will happen. 2) The national debt is nothing to worry about. 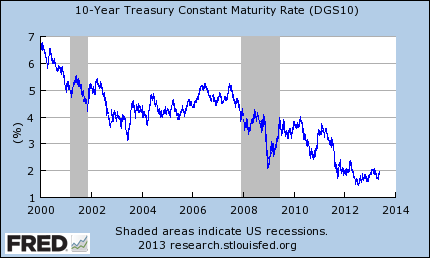 See above for a chart of yields on 10-year US Treasury Bonds. Since the 2008 crash, the government has borrowed hugely, but borrowing costs for new debt have plummeted to the point that people now are paying for the privilege of giving their money to Uncle Sam for ten years. Why is this happening? Rates on US debt are the combination of expected inflation (low), expected real short-term interest rates (low), and a “term premium,” (i.e., it costs more to borrow money for 30 years than for 5). But the financial system is awash in liquidity—corporate profits are at historic highs, and labor’s share of national income is at historic lows. Because of the weak recovery and the corresponding weak wage growth, business and finance see little to invest in—why build more factories if people can’t afford more products? In other words, all this cash the economy is producing has nowhere to go, so it goes into US debt. Kinsley keeps asking how we’re going to deal with the national debt. Krugman has said this before, but the answer is: when we get back to full employment. When we get to full employment, the Fed can raise interest rates off the floor without causing a recession. Then we can do some fiscal consolidation without cratering the labor market because the Fed will be able to drop rates to compensate. As Matt O’Brien points out, the longer it takes to get to full employment, the greater the number of long-term unemployed there will be, who find it nearly impossible to find jobs. This is fast becoming a major structural problem in the US economy, one that took WWII to solve last time it happened. Personally, I’d say this country could use five years at least of rip-roaring wage growth to make up for the last forty, but this is the basic picture Kinsley is asking for.